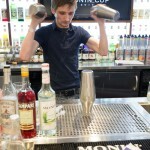 Take eight up and coming young bartenders, put them behind the bar at the smart new Monin Studio in Hoxton, give them a choice of over 100 premium syrups, then challenge them to define the UK in a cocktail. 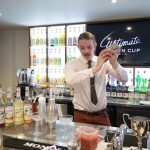 Welcome to the UK Monin Cup 2014.
regional heats, eight finalists descended on the Monin Studio to recreate their definitions. 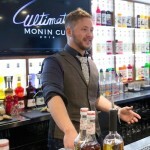 At their disposal was pretty much the entire Monin range of Premium Syrups. And when we say ‘range’ we’re talking upwards of 100 flavours. 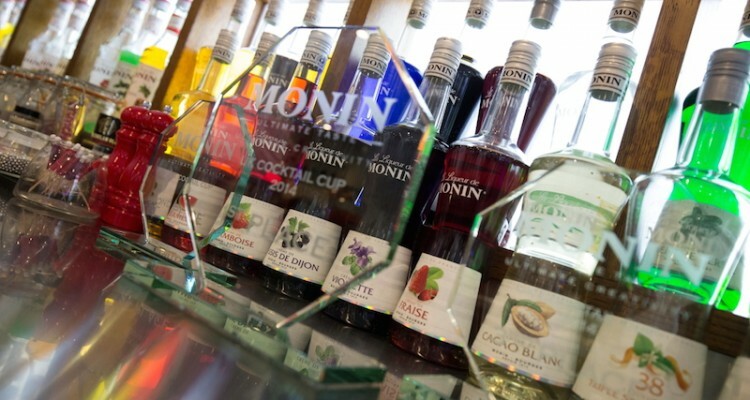 With them all on display at the Monin Studio we’ve never seen a back bar like it. Chocolate Cookie and Tiramisu. We could go on but you get the idea. We’re talking choice on a major scale. Alongside the seemingly endless choice of syrups the bartenders had a fairly free reign, choosing from any base spirit, juice or homemade ingredient. The key thing though was that the finished drink showcased the syrups whilst being well balanced and not overly sweet. 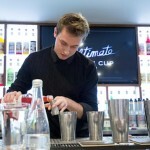 The judges would also be looking for originality in the drink, brand knowledge and an engaging performance. Oh, and just for good measure our bartenders also had to identify ten Monin syrups in a blind tasting. 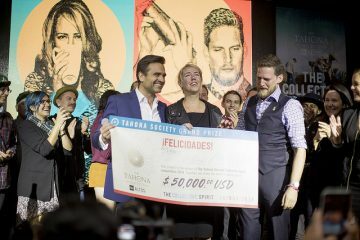 No one said it should be easy, but then the prize is a trip to the home of Monin in France and a place at the Global Final. 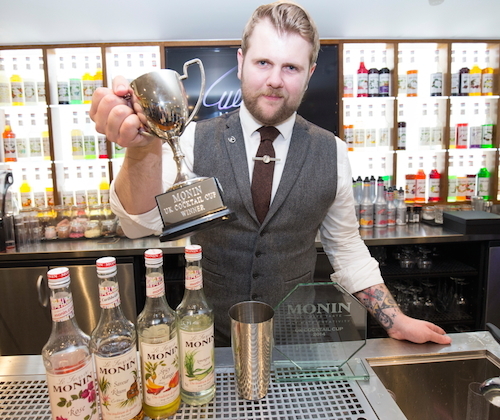 One of the aims of the Monin Cup is to encourage emerging talent in the drinks world, so all entrants have to be under 27 years. Having come through regional heats there were eight young hopefuls on the big day. 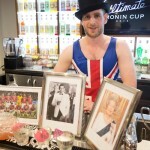 The tough job of tasting and assessing went to William Humphery, Event Manager at The Bartender Hire Company and Monin Cup UK winner 2012; Darril Ling, Monin UK Brand Manager and us. So, what would the UK be if it were a cocktail? Over two hours or so we got a lot of answers to the UK question. And trust us, they were far more interesting and tasty ones than those offered by current politicians. Grenadine, Citron and Vanilla syrups with Aperol, Zubrówka vodka and apple juice for his Rhubarb and Custard. homemade, containing pomegranate and ginger, and designed to complement the Ocho tequila base and gomme and pomegranate syrups by being dipped into the cocktail to the drinker’s taste. Joe Wild had a very personal view on what makes the UK unique. 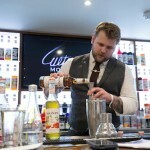 Cleverley combining and representing different cultures through his choice of four of the more unusual syrups available: Caribbean Rum syrup for the West Indies, Spicy Mango for India, Lemongrass to represent China and Rose to express England. 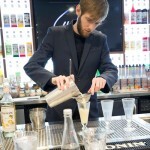 He also made a point of using an English vodka as the base spirit, but chose not to reveal which brand, preferring to keep the focus on the Monin syrups. The result was an exceptionally well balanced drink, All For One & One For All. extract, made for a full flavoured drink which would be equally at home in your favourite cocktail bar or local pub. Kieran Grieves evoked countryside aromas and flavours with Basil and Grapefruit syrups, fresh thyme and Beefeater 24 in his Escape To The Countryside. And for Dai Wakely it was all about his Welsh home with Hazlenut and Cinnamon syrups complementing the Penderyn whisky and the accompanying Welsh cakes for his Of Heaven. Frankly this was no easy decision and things were very close amongst the top spots. 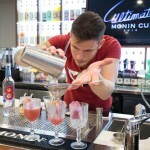 The judges liked the inspiration, serve and sheer tastiness of Beer and Monin in Gin City from Jake Mellish from the Boilermaker in Nottingham. He also impressed with an almost encyclopaedic knowledge of the Monin brand – enough to secure third place. Nottingham also grabbed the second position care of the Lacemaker’s Joe Macbeth for his exceptionally delicious Royal Flippin’ Mess. featured syrups, and for the resulting drink itself. 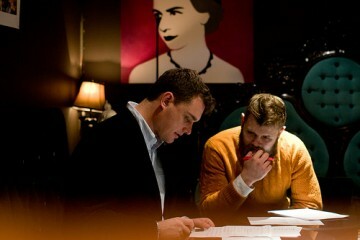 As for us, Joe was quite simply the complete package from idea to execution. Bring on France to show what the UK is all about. 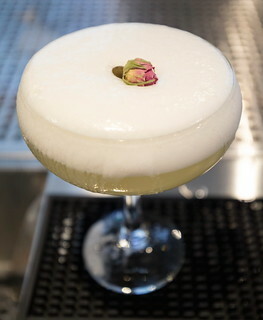 Shake ingredients and serve straight up in a Coupette topped with Prosecco and garnished with a rose bud. Shake and strain ingredients with ice and fine strain into a small knickerbocker glass with two retro, spiral-pattern, coloured paper straws. Garnish with a cinnamon stick, mini meringue, blackberry and a rhubarb and custard sweet. 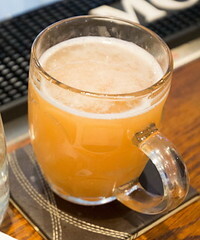 Shake and double strain into a chilled 1/2 pint tankard. Garnish with lemon zest over top of drink. 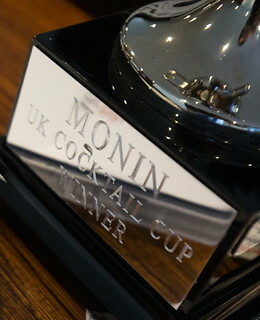 The Monin Cup Global Final takes place in Paris, 1st December.